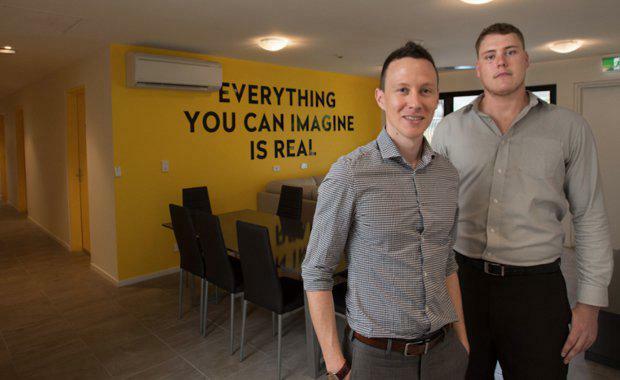 Maintaining a simple and small business model has helped put Hive Student Accommodation on the "front foot" in the competitive inner-city apartment market, according to the company's director, Daniel Brennan. The 30-year-old QUT graduate established Hive Student Accommodation, based in Kelvin Grove, alongside fellow QUT Alumni Dominik Waldmeier and Natalie Saint-Forrester. As a specialist property management company, the company manages student housing for small-to-medium (50-150 bed) complexes built and owned by investors, and says its portfolio occupancy rates averaged 50 weeks or 96 per cent capacity. The company works in association with property owners, investors, local universities such as QUT, UQ, Griffith and health care providers such as RBWH. With these partners, Hive provides share housing and rooming accommodation for students & young professionals in Brisbane suburbs close to universities and medical education facilities. “It has been a fast-paced two years, as we went from no revenue and $10,000 in seed funding to managing 500 rooms,” Mr Brennan said. Within two years the company’s turnover reached $500,000, doubling the target the founders had set themselves. “We have been really pleased with the consistent growth Hive has experienced since starting and feel this can be directly attributed to the results we have been able to achieve for our investors and students,” Mr Waldmeier said. Hive’s first purpose-built complex opened in January at 141 Kelvin Grove Road, Kelvin Grove, in close proximity to QUT and the Royal Brisbane and Women’s Hospital, reaching over 80 per cent occupancy with a short four-week marketing campaign. Weekly rentals range from $170 for a standard room to $350 for executive rooms, with rent inclusive of utilities and internet. Mr Brennan said the softening demand of inner-city residential units provided unique opportunities for student accommodation operators to acquire development sites to specifically cater for student housing. Most buildings offer fully-furnished shared accommodation units and self-contained studio apartments with access to onsite gym, common areas, study spaces, restaurants and planned events. “We have a number of projects on the horizon for 2017 and are looking for developers and investors to partner with as we continue to expand on the strong brand position Hive has established within Brisbane’s student accommodation,” Mr Waldmeier said.